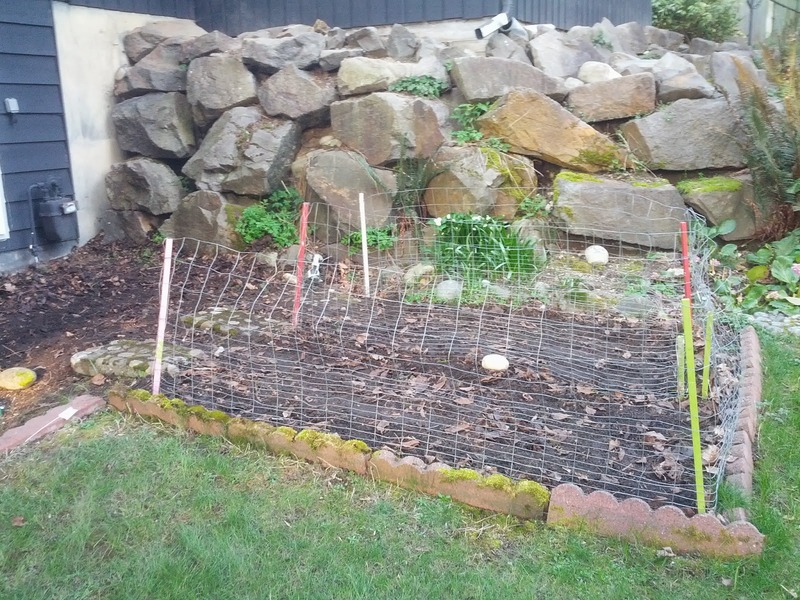 Still no baby on Wednesday, so I decided we couldn't put off planting our garden any longer. After going to the library in the morning, we went over to get some high quality horse manure compost from our neighbors. 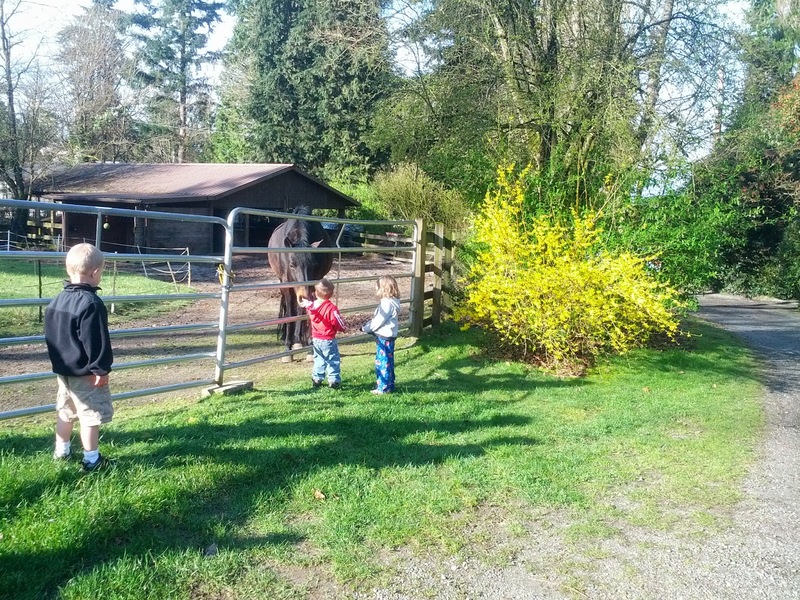 I had to document B letting a horse touch him without screaming and running away. Megan offered to let Eloise sit on one of the horses after we filled our pails with poo, but she was too shy, B is too afraid of the horses, and Jared wasn't there for the offer. Three hours of work and worm finding later, this is what our garden looks like. It isn't terribly impressive, but it is a labor of love. Today I needed to go to a grocery store half an hour north of home to stock up on some canned goods that can be found much cheaper there. While we were in the neighborhood, and since the kids were very cooperative at the store, I owed them a ferry ride. 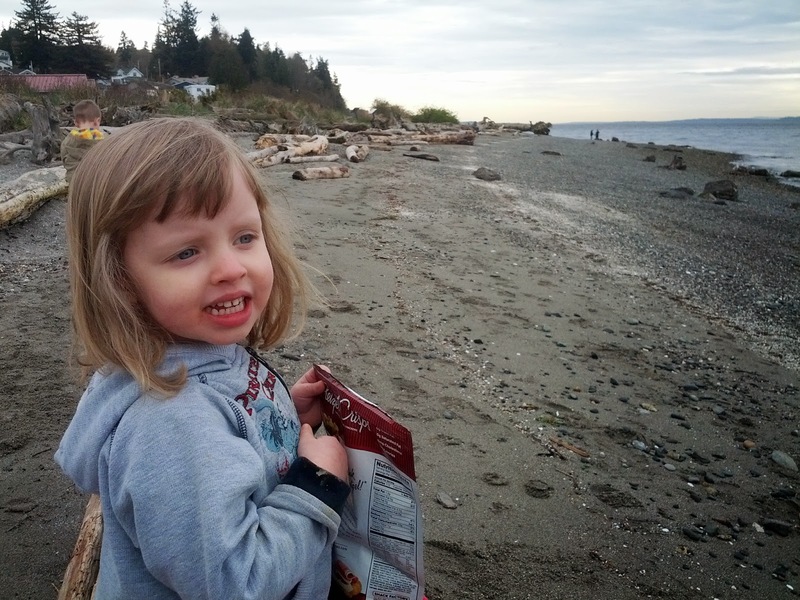 We started with a picnic on the beach at the Mukilteo Lighthouse Park. 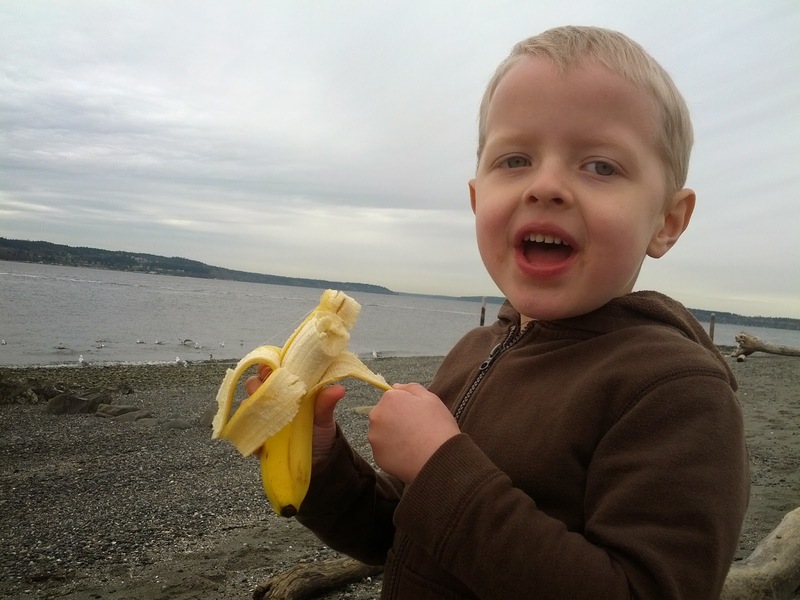 These pictures were taken before we added layers of jackets to keep out the blustery sea breeze from Puget Sound. As soon as we pulled into the parking lot, B yelled, "Seagulls! Can I go chase seagulls?!" After a stop at the bathroom, and a run to the car for B's emergency pants and some extra jackets, we went to the playground. We stayed there until we saw a ferry approaching. 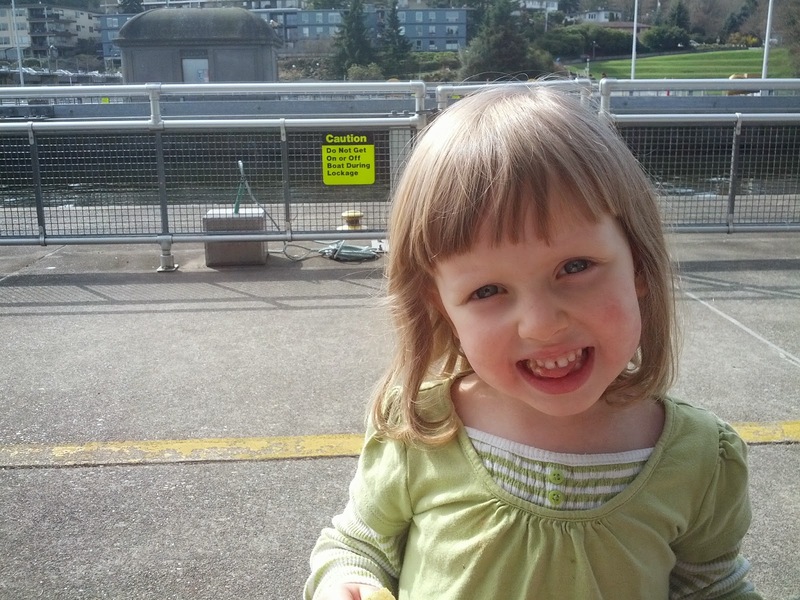 We grabbed the stroller from the car and jogged to the boat to get aboard before the ferry departed. The ticket seller told us that there have been some whale sightings in the sound recently, so we should keep an eye out. The passage between Mukilteo and Whidbey Island is very narrow, so we didn't expect to see anything. 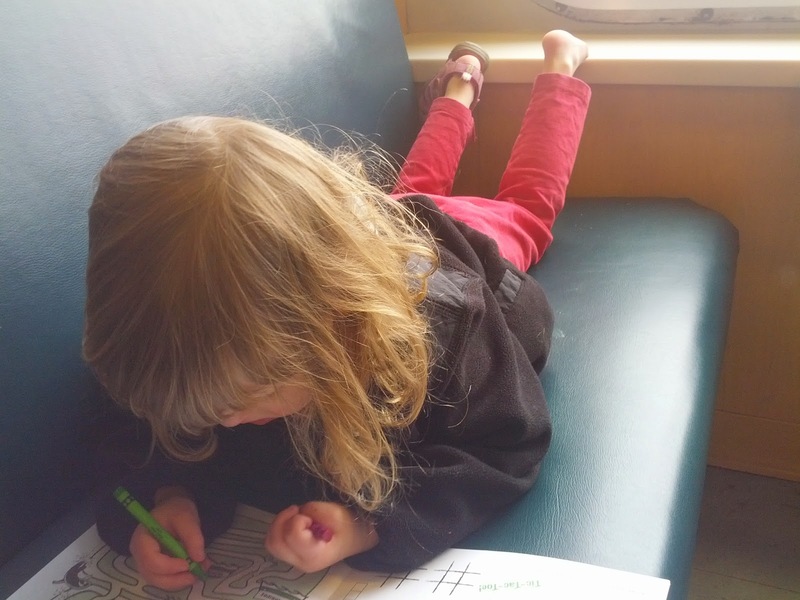 Eloise preferred to color her ferry coloring book instead of looking out the windows. On the return passage we watched the cars being loaded, and the drawbridge being raised. Then we walked to the opposite end of the ferry to see the shore approaching, but the wind was so strong out front that we could barely stay standing, so we retreated inside. 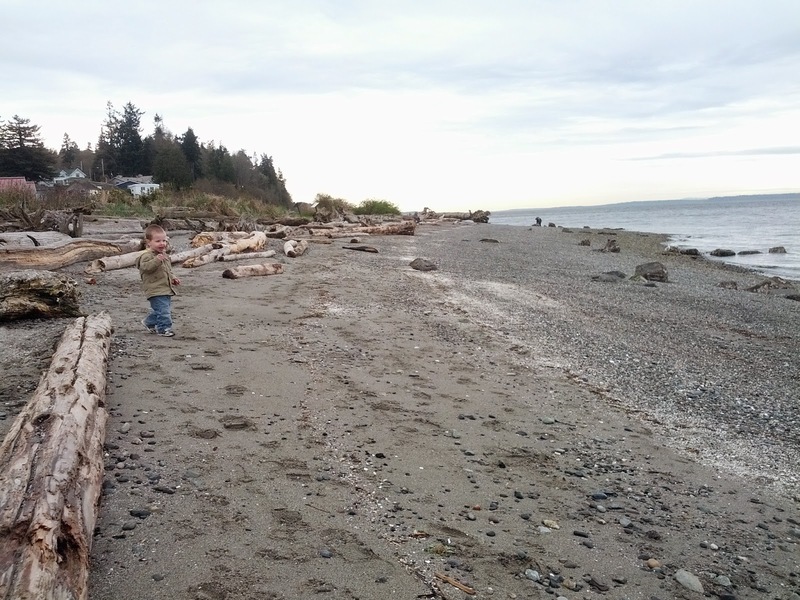 Once we made landfall, we jogged back to the car, where kids who were previously distracted by the beach had to have picnic round two, and then we drove home. B fell asleep as soon as the car turned on, I think, since he had only taken two bites of his apple. And now, if we are lucky, this will be the last big outing before baby brother is born. We are still taking suggestions for baby boy's name, so get your nominations in soon. I fully expected to have a baby this week, so when I woke up on Tuesday not in labor, I had no plan. I put the kids in charge of the day. 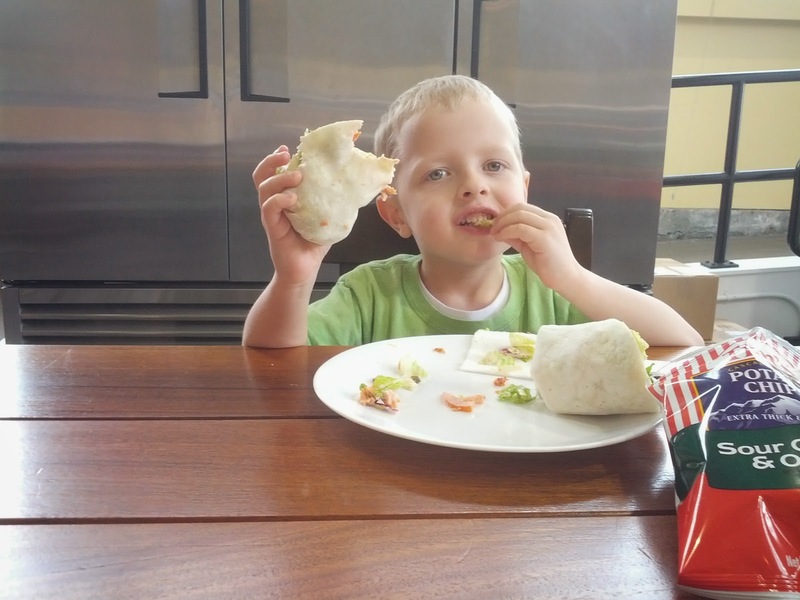 When faced with a choice of anything in the world to do, Jared asked to go to the Ballard Locks and fish ladder, stop at our favorite salmon wrap restaurant for lunch, and stop for ice cream. 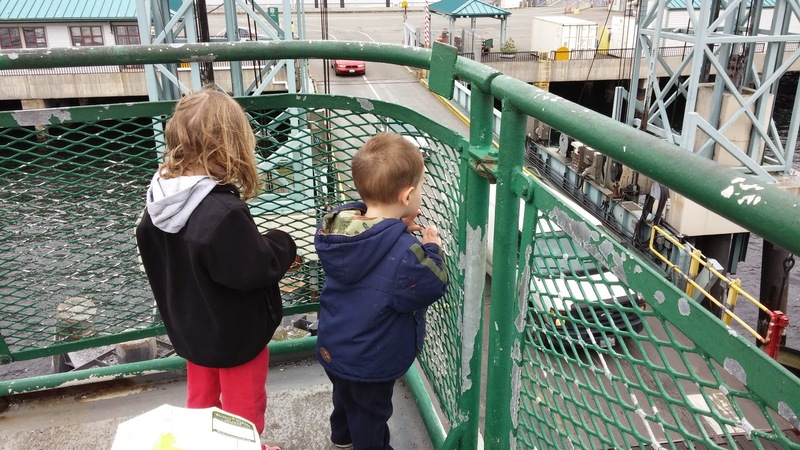 B wanted to go to the zoo, and Eloise wanted a ferry ride. We started by walking through the locks to our cafe. The proprietor, Low (short for Lawrence), is the nicest guy in the world. When Jared had to go to the bathroom, Low walked Jared through the secret passage (complete with coded locks) to the bathroom shared by several store fronts. Maybe we are getting a little bit too comfortable here. B's response to everything that frustrates him lately is biting Eloise, and this gets especially bad when he is tired or hungry. Jared doesn't get bit very often because he doesn't have any qualms about bowling B over if he tries to bite. 98% of everything B does is unbearably cute, but the other 2% is pretty nasty. I guess this is pretty normal for his age. When we were done with lunch, we walked back through the botanical gardens, which were overrun with Canada Geese (which each poop over a pound a day, for your information), back to the locks. 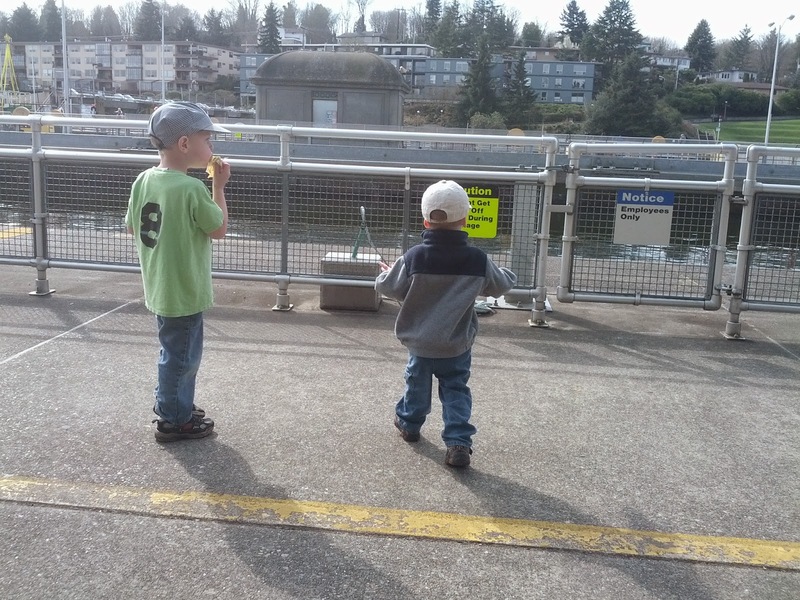 The fish ladder was closed for maintenance, and it was a slow day for boats, but these kids are still cute, and they had a good time. Anyone want to see Eloise. . .
. . . a little closer? 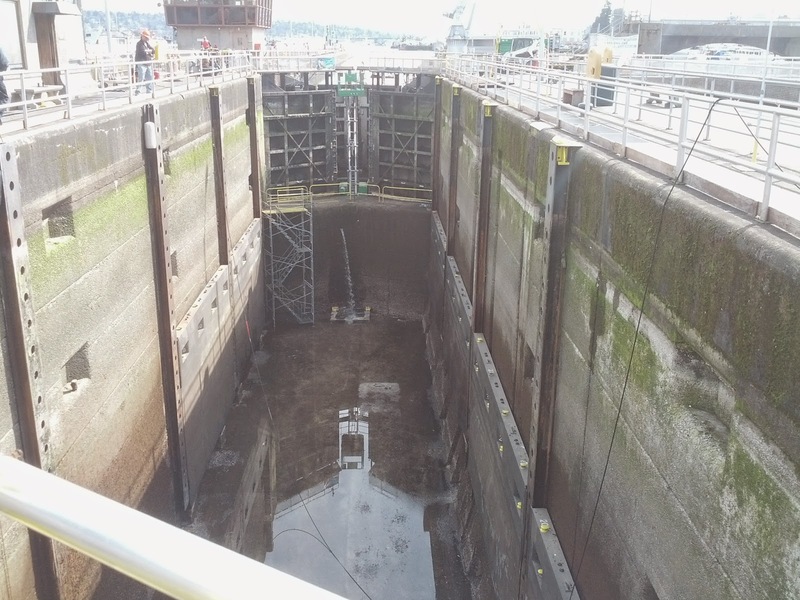 The small lock was closed for cleaning and repairs. I had never seen it drained before. It was interesting to see scaffolding where there is usually 20 feet of water. 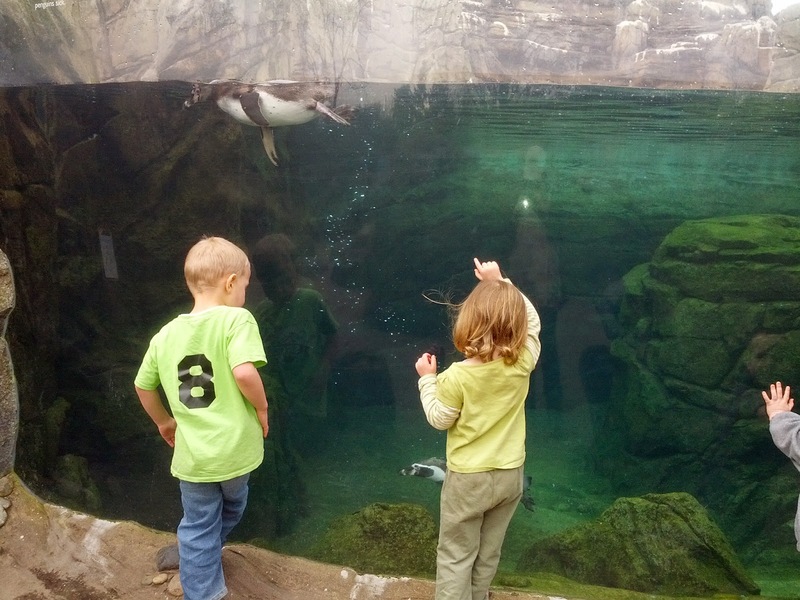 Since the locks are only a couple of miles from the zoo, we stopped at the zoo on our way home. What was the highlight? 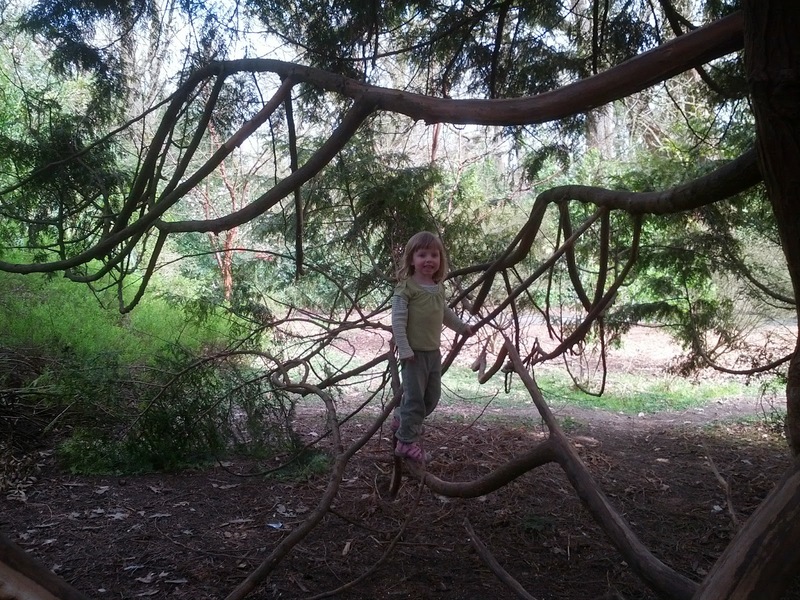 The climbing tree, of course. This is why we get a membership instead of just paying for the occasional overpriced ticket. 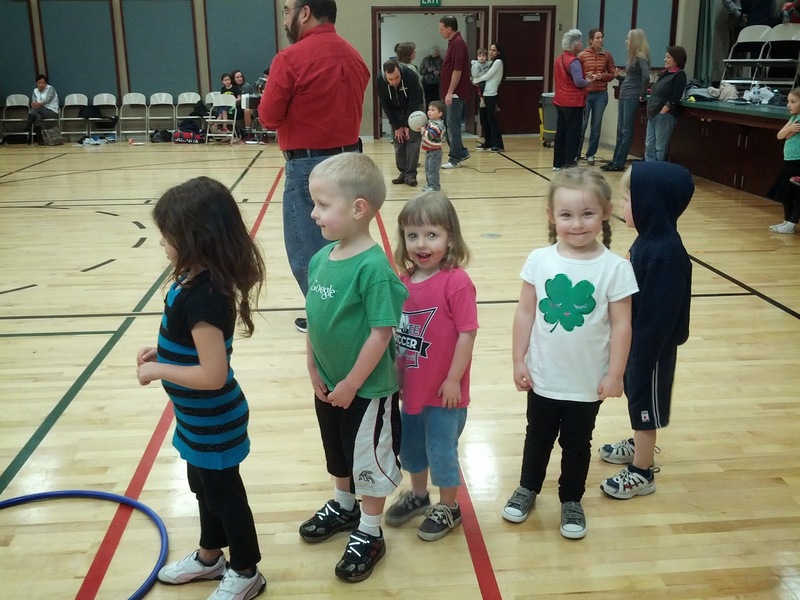 Little green St. Patrick's Day monkeys. 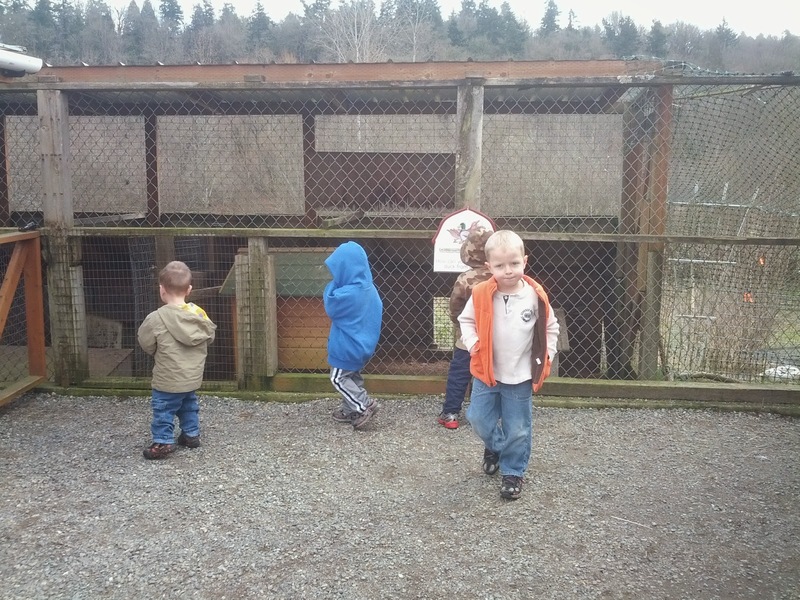 These kids were pretty tired, but made it through the zoo mostly happy. No one actually fell asleep until the drive home. 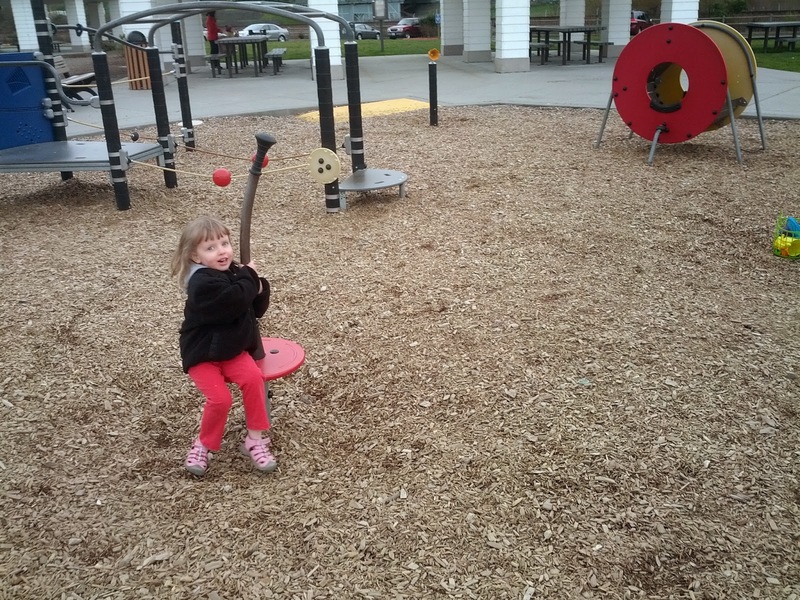 I wonder how many miles we walked before we got to this playground, and everyone still had the energy to play. 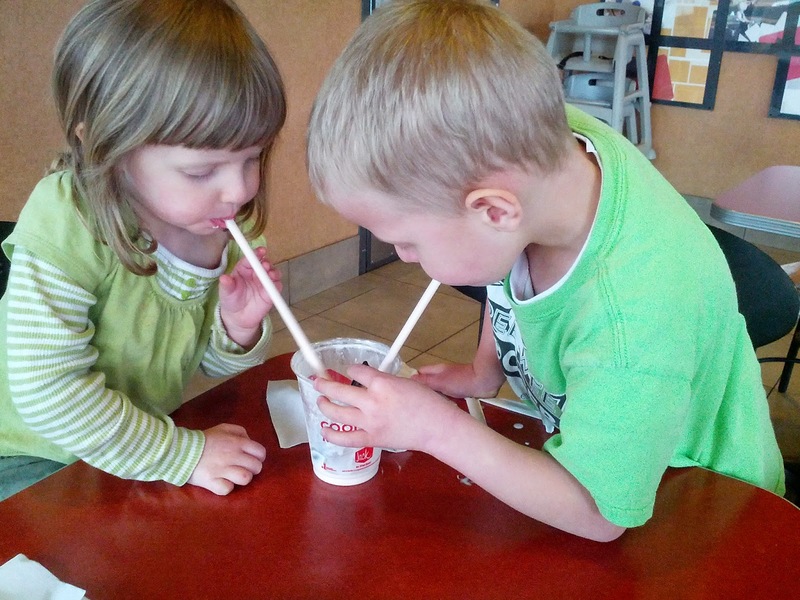 I didn't really want to go to an ice cream shop with a tired troupe of children and overwhelm them with flavor choices until they had a collective breakdown, so we just stopped for a Jack in the Box shake on the way home. Everyone was happy with four flavor choices. We ran out of time for the ferry, since I had a relief society church activity in the evening, which Todd was signed up to babysit for, so everyone had to be ready to come along. It was a very full day. 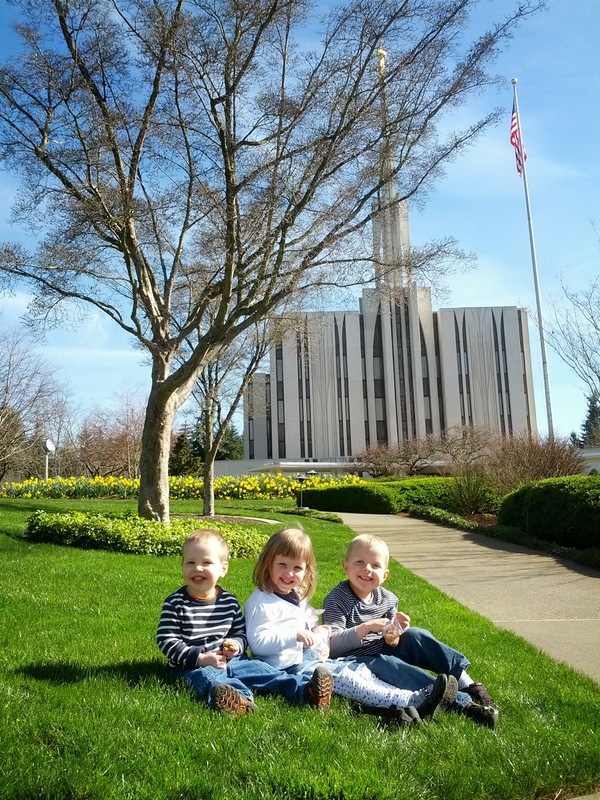 B's favorite song is "I Love to See the Temple." He has a picture of himself at the temple in his room, which can be seen here, but, while he thinks the baby in this picture is very cute, he doesn't really identify it with himself. 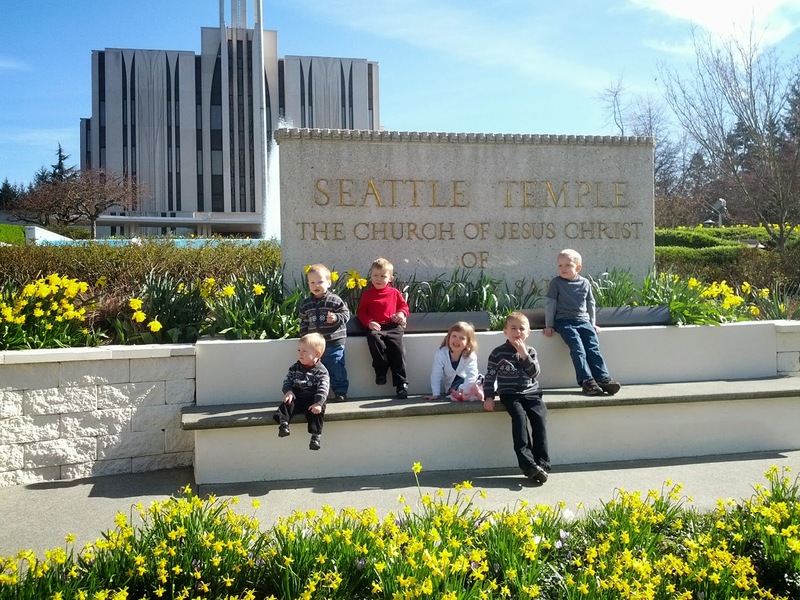 It was time to update, so we met the Christensens at the temple so that Rebecca and I could take turns doing half an hour of temple work and watching all six kids. This is the best picture I got of the Knight children. Now B should be able to recognize himself in his temple picture. Jared was not feeling well at the temple. It is a lot of work to keep track of five energetic children when the sixth one weighs 45 lbs and wants to be held all of the time. The following day, our ward combined with another ward for a March Madness basketball party. Jared was feeling better. He got pretty excited about basketball. I may have mentioned that we are having the mildest winter that we have experienced in Washington. 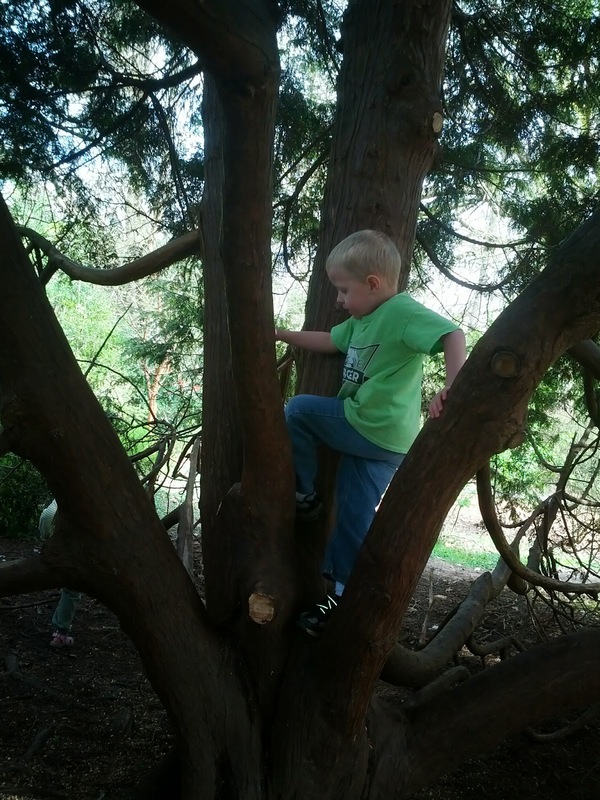 We have had plenty of opportunities to play in the woods. This was a Sunday afternoon walk with Daddy. The trail wasn't even very muddy, since we are only getting the occasional rain storm. 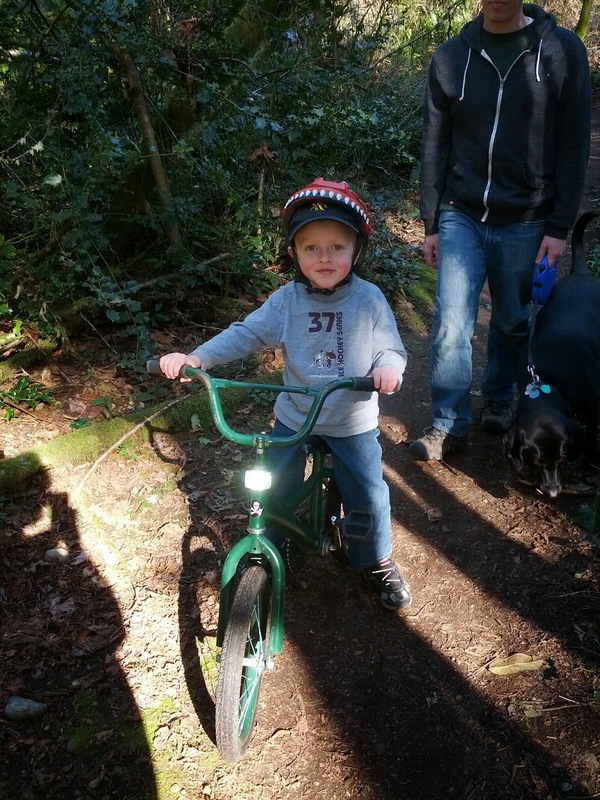 These are my future mountain bikers. 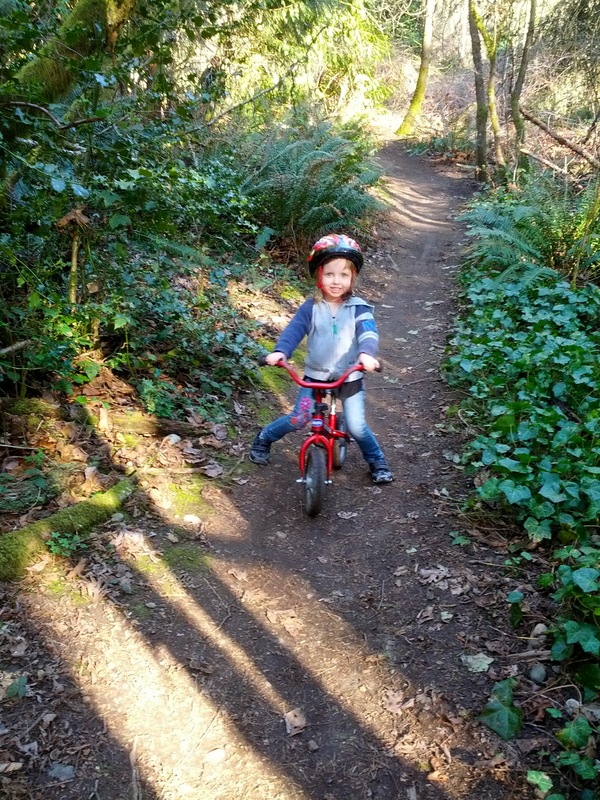 B wiped out on a pinecone and got a big, fat lower lip, but he bounced up and started running again immediately. There is no sense wasting a good hike being sad about a little blood. 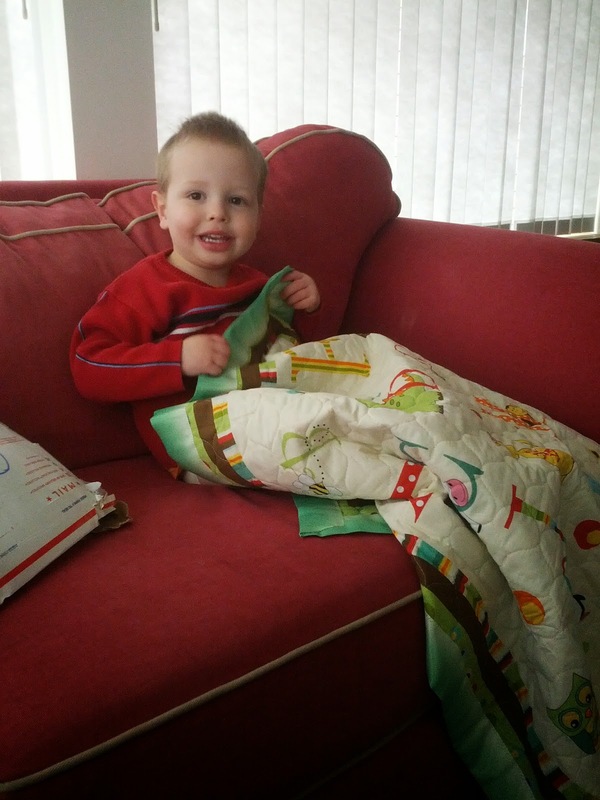 Grandma Jill made a blanket for our new baby. B, for whom the new baby is still hypothetical, adopted it as his own, and magnanimously bequeathed his own baby blanket to the "new baby." Both blankets are currently on B's bed. Both are going by the moniker "B's animal blanket." B is in for quite the awakening when new baby actually arrives, and I'm not sure that he is going to like it one bit. 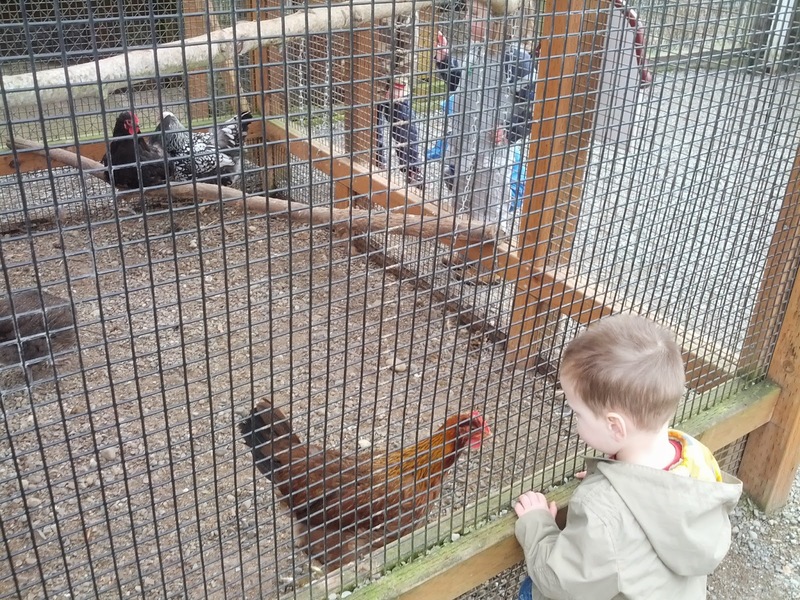 This morning we went to the farm. It was a sunny morning with just a hint of chill wind. 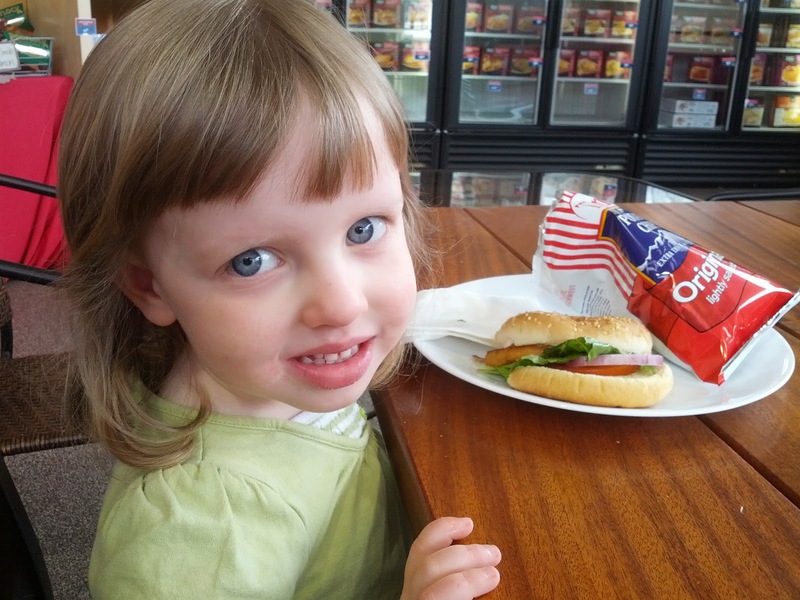 Eloise rode the bus to work with Daddy, so we picked her up on our way to Bellevue to go to Kelsey Creek Farm Park. We also collected the Christensens, but we took two cars so that they could get Grant back for kindergarten on time. Jared had a little mishap with the extra long t-shirt he was wearing, and his perpetual distracted-ness, even while using the bathroom, and ended up going to the farm in one of Grant's shirts. 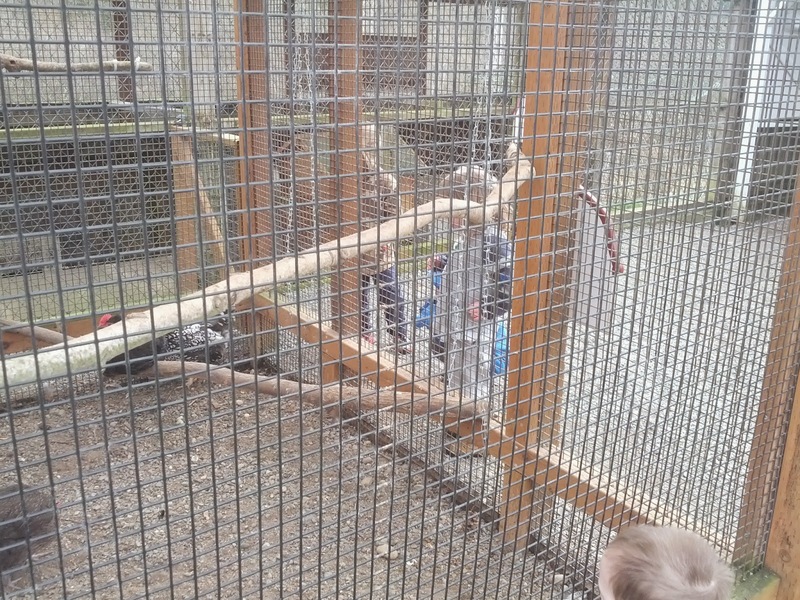 The great thing about the farm is that the animals don't really get to go off display. The farm workers turn them all out into their pastures and yards in the morning, so we always get to see every animal. 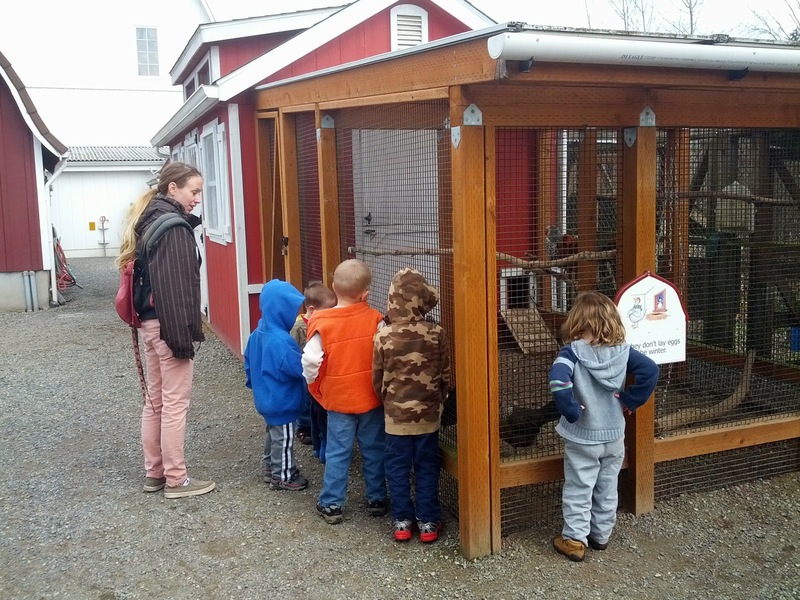 Another great thing about this farm is the playgrounds/sandboxes/tractors placed every few feet so that not all members of the party have to be equally fascinated with animals for all to have a great time. 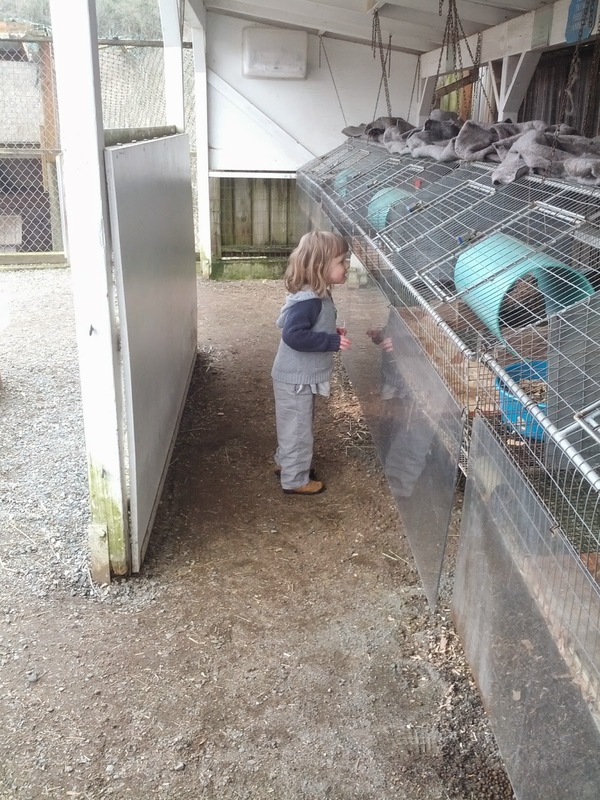 There isn't really any question about the Knight children's interest in animals. All four farm bunnies were just eating breakfast, and the ducks were splashing like crazy in their little pool. 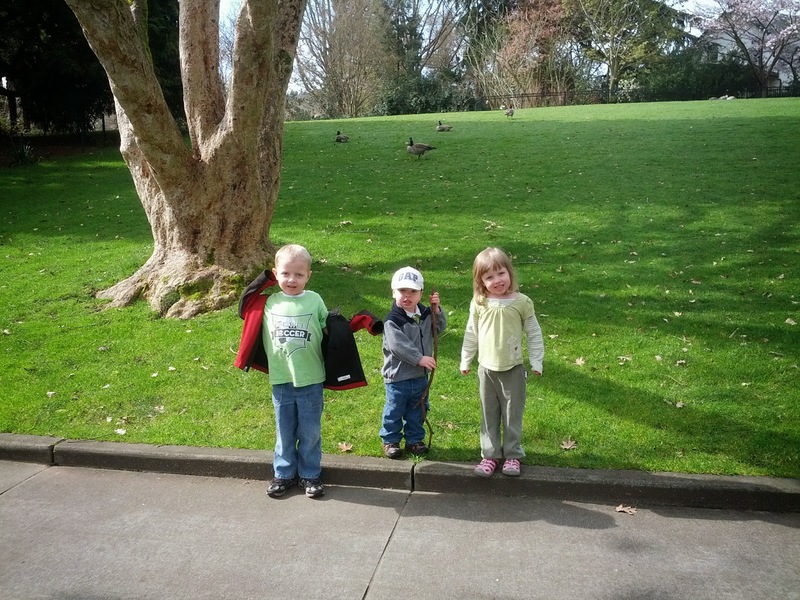 Grant, Max, and Price got to run to their hearts' content, and all of the children except Price played Wild Kratts on the playground. 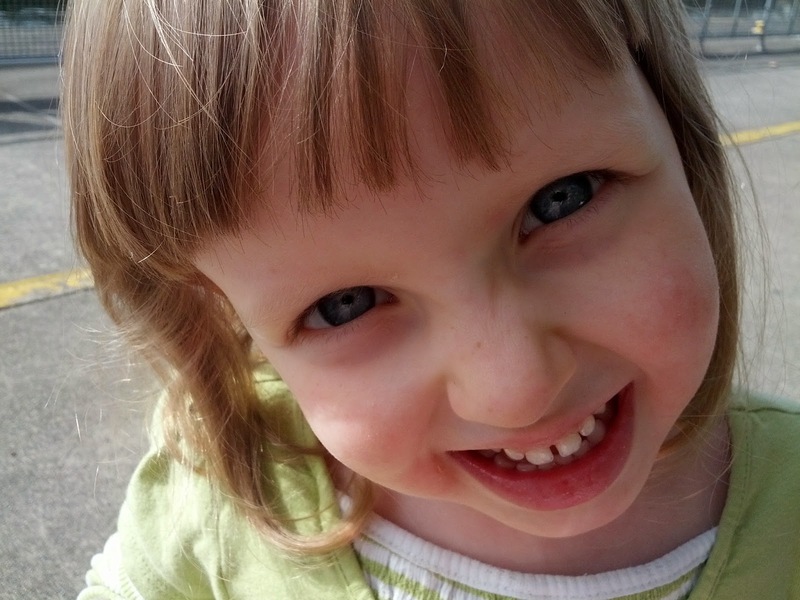 We saw all of the animals, played in the sand boxes, climbed on the tractor, and headed back to the playground for lunch, where Eloise weighed her urge to use the bathroom against her hunger and decided to hold off going to the bathroom, which turned out to be a mistake. Fortunately I had an extra pair of pants for B which were just a tiny bit short on her. After a big combined picnic, a lot of squirrel chasing, and some time on the playground, the Christensens left to get Grant to kindergarten on time. I let team Knight play a little bit longer, and then I rounded them up. That is to say, I announced that we are leaving, and Jared and Eloise climbed into the stroller with many protests. B ran the opposite direction. When I ran after him, he began to have a tantrum. 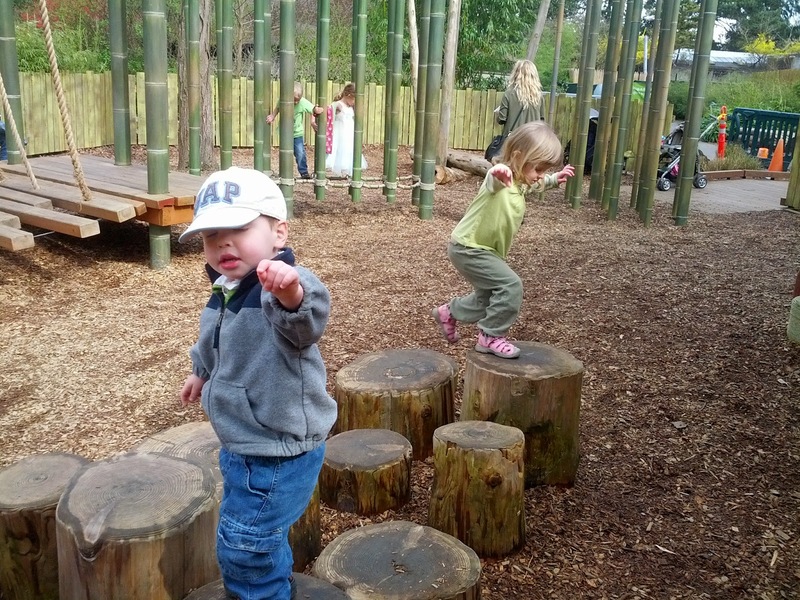 He started screaming something about the playground being the source of granola (ganilla) bars. 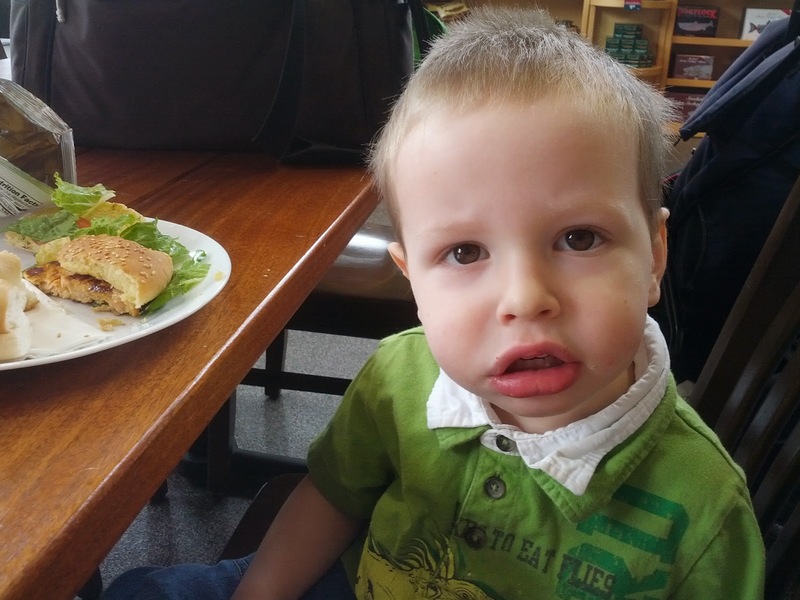 When he showed that he was determined to run the opposite direction from me, no matter what, I hoisted him over my shoulder with one arm, only to discover that he had poop all over his shirt, rain coat, pants, and diaper. The only thing to do was keep him flung over my shoulder, flailing and screaming, and push the stroller to the car where I could change him without him escaping. 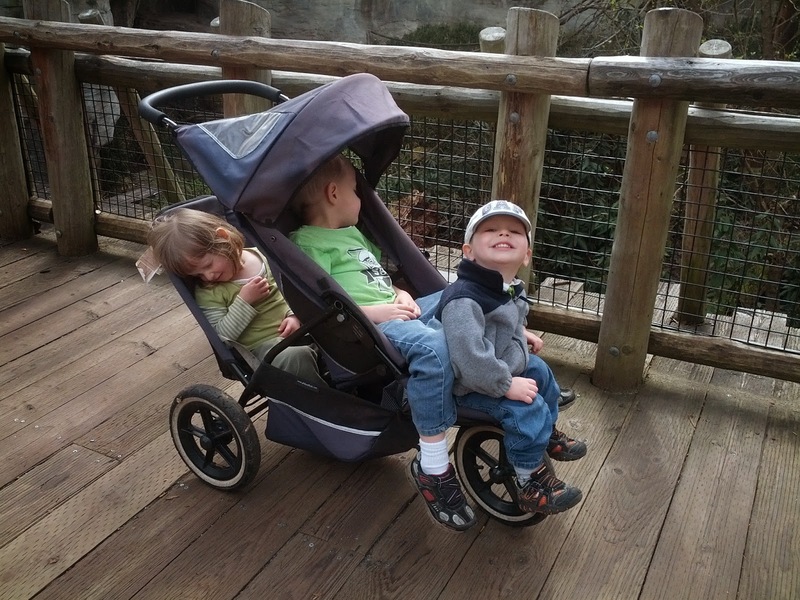 When I came to a sharp curve to get onto a bridge, I asked Jared to get out of the stroller, since he made it too heavy for me to turn and push uphill one-handed. Me: Jared, can you please get out of the stroller? I can't push it here with one hand, and I can't put B down or he will run away. Me: Okay. I will just have to leave you here until I get B strapped into his car seat. I can see the car from here, and I know that you can walk that distance under your own power. Jared: I don't want to walk! Stop yelling! Me: I'm not trying to yell! I can't hear how loud I am because B is screaming in my ear! Can you please help me? Can't you see that I really need help?! At that point I abandoned the stroller because squirmy, screaming, kicking B was trying to flip over on my shoulder, which would have resulted in poop in my hair. 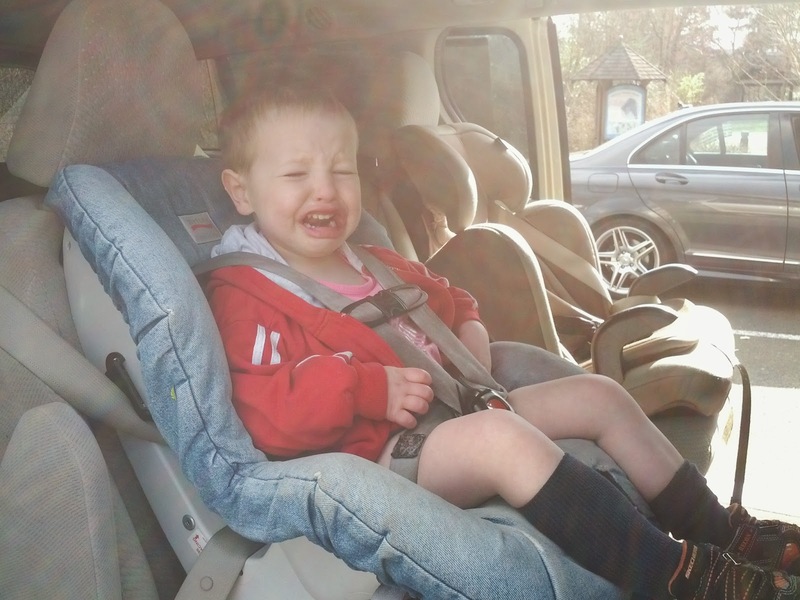 Eloise started to cry because I was leaving her, and Jared jumped out of the stroller hollering his own protests at the cruelty of a world that, as it turns out, does not to revolve around him. All of this was observed by a group of well dressed elderly Asian people who were just arriving at the park for a peaceful communion with nature. The resources of my bottomless diaper bag were a bit strained, as Eloise was already wearing the extra pants and socks I carry for B, and I used my final four wipes cleaning B up, so B got to come home in Eloise's spare pink shirt, a purple diaper, and his shoes and socks, because, pants be hanged, he was deeply troubled by the idea of the car starting without his shoes on. Eloise ninja-kicked B in the head because he was wearing her favorite pink zebra shirt, not recognizing the irony of the situation, as she was wearing his favorite fleece sweatpants. I'm sorry to say that this resulted in more shouting from me about how unacceptable it is to kick one's brother in the head under any circumstances, but especially those presently before us. I must say I have learned my lesson. I am no longer in any hurry for baby #4 to arrive in this family. As foolish as I look with a giant baby belly and a toddler flung over my shoulder, I can't imagine that a squalling baby would have improved upon this scene in the slightest. I post a lot of cute pictures of our family having delightful adventures, but this is a real family. Not every outing to the park is idyllic. My main consolation in this case is a mental picture of all of you (and myself, in a far distant future) getting a good laugh at how thoroughly we all fell apart this time, especially you, Mom.